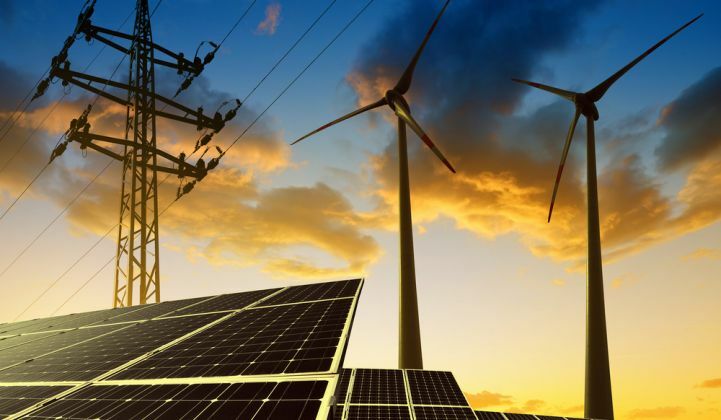 The U.S. advanced energy industry generated $200 billion in revenue last year, according to a new report by the national business organization Advanced Energy Economy and Navigant Research. That’s nearly double U.S. beer sales and on par with pharmaceutical manufacturing. 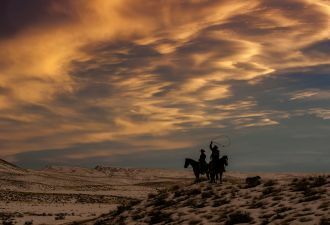 It’s also just a 1 percent increase in the amount of revenue the U.S. advanced energy industry earned in 2015, making overall growth effectively flat year-over-year. But a closer look at the numbers tells a different story. A $7 billion decline in revenue from ethanol, hurt by low oil and corn prices, brought down results for the entire U.S. advanced energy sector -- which AEE defines as products and services aimed at establishing a “secure, clean and affordable” energy system. Ethanol sales in the U.S. have dropped by half from a peak of $40 billion in revenue in 2012, while investments in ethanol refineries have fallen from $1.9 billion in 2014 to zero in 2016. Without counting ethanol, however, the U.S. advanced energy market grew by 5 percent in 2016, three times the growth of U.S. GDP. Revenues in advanced energy generation -- a category that includes solar, wind, nuclear and geothermal energy, as well as natural-gas turbines (but not extraction) -- also saw revenue grow by 5 percent year-over-year. Solar led the segment with a 30 percent revenue increase over 2015, up $5.7 billion to $24.9 billion. That’s up from $8.2 billion since AEE began tracking the sector in 2011. Solar revenues are now also well above wind in a marked shift from just a few years ago, although solar project prices are still higher and cumulative generation is lower. The U.S. solar industry added a record 14.4 gigawatts of capacity in 2016 -- a 95 percent increase over 2015. 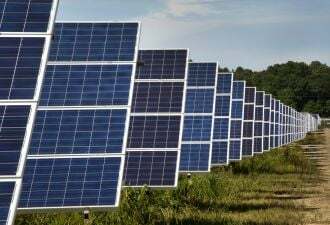 Global solar deployments also hit an all-time high with an estimated 77.2 gigawatts of new capacity installed around the world -- up 52 percent over the 51 gigawatts added in 2015. Strong growth in solar comes as several companies have shed jobs and even gone bankrupt, most notably SunEdison. As solar boomed, wind energy revenue fell slightly to $14.1 billion in 2016, from $14.4 billion in 2015. But strong performance year-over-year is a welcome development in a sector plagued by booms and busts amid policy changes. Navigant Research estimates 8.2 gigawatts of wind were installed in the U.S. in 2016, bringing the cumulative total to approximately 84 gigawatts. 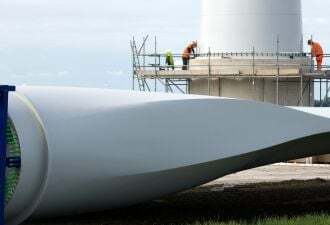 With a five-year extension and phase-out of the wind Production Tax Credit on the books, annual wind capacity additions are projected to be between 8 gigawatts and 9 gigawatts from 2015 through 2018. Under President Trump, the Obama administration’s Clean Power Plan is no longer expected to drive continued expansion of renewables like solar and wind beyond 2020, but last year’s performance shows the sector is competitive independent of additional policy measures. Furthermore, the advanced energy sector now represents a major U.S. employer. Like solar, building efficiency also had a strong year in 2016, which helped make up for the decline in ethanol revenue. Overall, the segment grew 8 percent to $68.8 billion last year -- which represents the largest segment of the advanced energy market that AEE tracks. Growth was led by energy-efficient lighting and commercial building retrofits, both up 7 percent, to $26.4 billion and $8.4 billion, respectively. In other positive developments for the advanced energy sector, revenue from U.S. geothermal energy grew by 40 percent last year to $629 million; revenue from fuel cells for onsite use grew by 21 percent to $373 million, and revenue from microgrids grew by 16 percent to $2.2 billion. While it remains a small market, energy storage also had a big year, with U.S. revenue jumping 54 percent, to $427 million in the U.S. According to a new GTM Research report, U.S. energy storage installations grew by 100 percent in 2016, highlighting a shift to longer-duration applications. Plug-in electric vehicles (PEVs) represent another emerging sector. In 2011, the segment brought in just $700 million in revenue. In 2016, the PEV segment grew to $7.8 billion, up 48 percent over 2015. While PEVs have yet to see the massive uptake advocates and auto companies are hoping for, vehicle sales have continued to grow despite low oil prices. Hybrid vehicles, meanwhile, took a beating due to low oil prices last year. Hybrid electric vehicles saw revenue fall for the third straight year, dropping 11 percent, to $8.9 billion. These slightly more efficient vehicles, which come at a premium, are finding it difficult to compete with regular gasoline-powered cars, which are becoming more efficient. Unrelated to oil prices, sales of clean diesel vehicles dropped sharply by 45 percent last year, a decline of $2.7 billion in revenue, likely in response to Volkswagen’s emissions violations. Global diesel vehicles sales continued to grow, however, to $306.6 billion, up an estimated 6 percent from 2015. 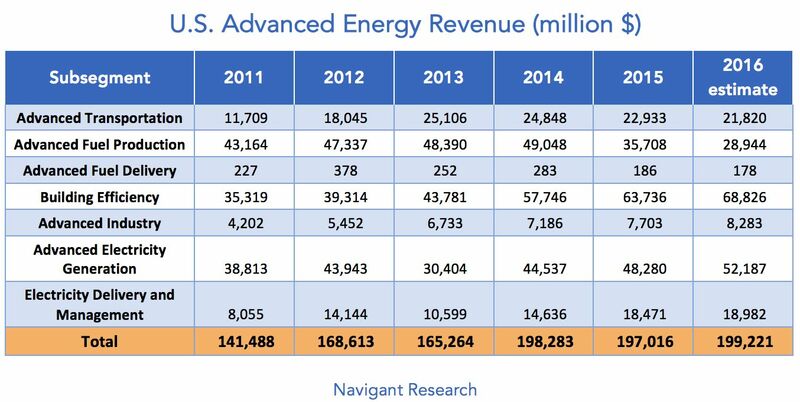 While total U.S. advanced energy revenue was effectively flat last year, worldwide advanced energy revenue in all segments tracked by AEE and Navigant grew by 5 percent from 2015 to 2016 -- nearly twice the rate of the global economy as a whole. 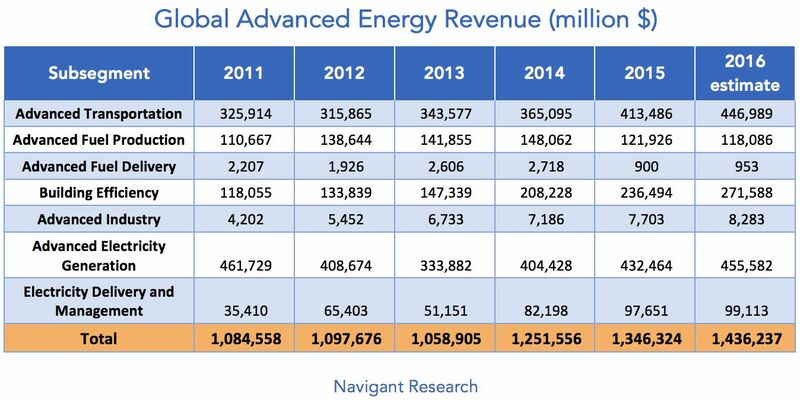 Advanced energy represented a $1.4 trillion global market last year -- almost twice the size of the global airline industry and nearly equal to the revenue in worldwide apparel.